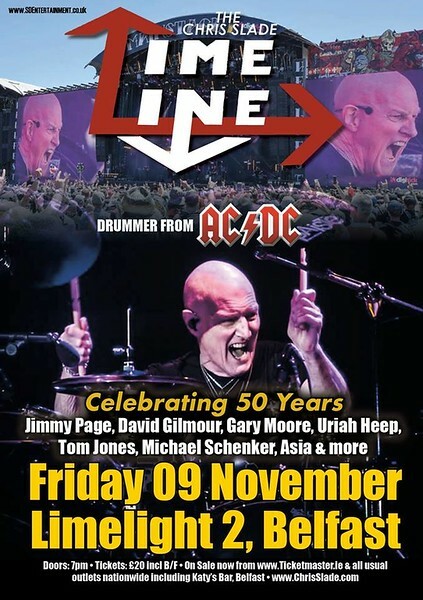 Legendary AC/DC drummer Chris Slade, aka Mr. Thunderstruck, is bringing his 'Chris Slade Timeline' show to Limelight 2, Belfast on Friday 09 November. Tickets on sale now from all Ticketmaster outlets nationwide including www.ticketmaster.ie. THE CHRIS SLADE TIMELINE perform music from all of the above, so expect to hear all the hits you know of rock megastars AC/DC plus plenty you forgot you love! The band have toured the UK and Europe extensively, continuing to delight audiences everywhere and allowing fans a chance to ‘get up close and personal’ with the drumming legend as he offers everyone a FREE MEET & GREET shortly after the show. The Chris Slade Timeline touring was interrupted for two years when CHRIS SLADE received the call from AC/DC at the end of 2014 to return for the ROCK OR BUST TOUR WORLD TOUR. THE CHRIS SLADE TIMELINE came back with a vengeance in 2017, this time taking with them the AC/DC ROCK or BUST TOUR drum kit to successfully extend their tour to France, Switzerland, Luxembourg, Belgium, Austria, Germany, Italy, Portugal and even Russia to perform at The MOSCOW OLYMPIC STADIUM for the KREMLIN CUP ATP World Tennis Tournament – The first rock band EVER to do this!! The band played many festivals last year, including SYLAK, headlining AQUITAINE BIKER WEEK and now in 2018 they have just performed on the mainstage at HELLFEST, headlined LE MANS 24HR and BONFEST - One of Europe's largest AC/DC Festivals. GIANTS OF ROCK 2019 in Minehead has already been confirmed. This will be the band's first ever performances in Ireland and tickets are expected to be swallowed up very quickly. The Chris Slade Timeline make their Belfast debut at Limelight 2, Belfast on Friday 09 November. Tickets are priced £18+B/F (£20.00 inclusive) and are on sale from all Ticketmaster Outlets nationwide.